SafeAir Contractors, Inc. is a full-service environmental remediation company, which provides cost effective solutions to all manner of environmental concerns. When environmental intervention is required, SafeAir Contractors, Inc. employs the most advanced technology to bring our clients into full compliance with all federal, state and local regulations. Our Management Team is well versed in all levels of the complicated regulations which govern environmental concerns, and both our management and staff possess the training and field experience necessary to complete projects in a safe, timely and economical manner. SafeAir Contractors, Inc., is a Certified Asbestos Abatement Contractor. We are specialists in the field of surveying your asbestos/environmental situation and providing a safe, economical and timely means to address your special project needs. Our record of performance is unblemished due to our continuous employee training and our commitment to follow, if not exceed, all rules and regulations applicable to the asbestos abatement industry. We are a professional Lead Abatement Contractor that specializes in surveying environmental situations and providing a safe, economical and timely means to address the special needs of that situation. Our commitment to a clean environment goes far beyond our Asbestos and Lead Abatement efforts throughout Ohio and Pennsylvania. SafeAir Contractors, Inc., also specializes in providing Mold remediation services for clients that find themselves dealing with mold spores. 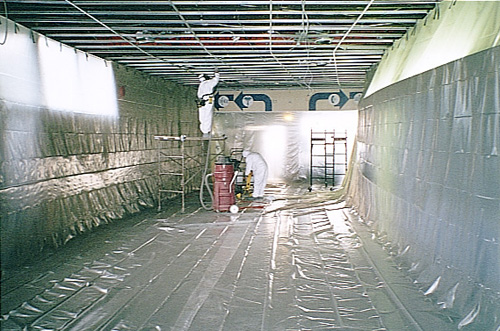 We can manage any Mold remediation project in a timely and safe fashion. We offer a multitude of services so that we can provide our clients with the most cost-effective options for environmental management and/or remediation. By minimizing the need for multiple contractors, we reduce project costs - both in time and money - for our clients. Our clients want their projects to run smoothly; and so do we. We realize that, for all of our clients, safety is of the utmost concern. That is why "Safety First" is our credo. Our staff consists of EPA/ODH/A.H.E.R.A/OSHA trained and licensed professionals who have vast field experience which enables them to put their training into practice. The combined expertise of our Management Team, field technicians, and equipment operators allows our clients to be confident that their projects will be performed with the highest level of professionalism and safety.